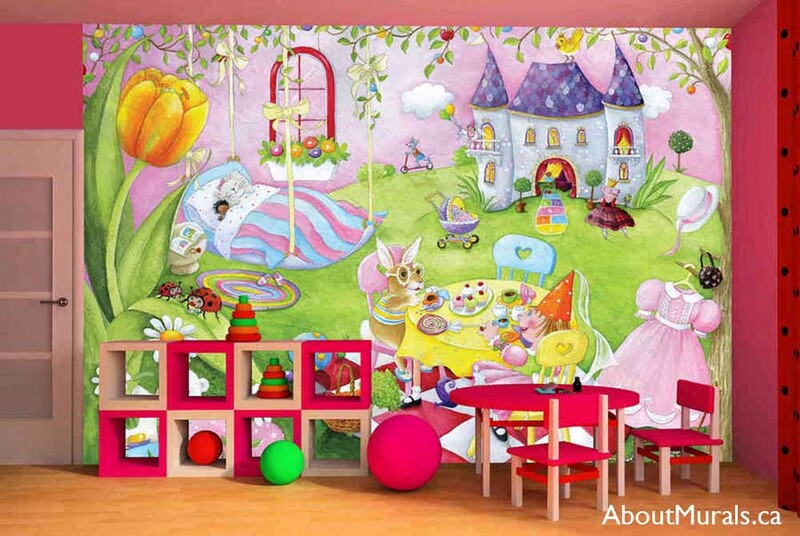 Although this princess mural was painted in Stoney Creek, Ontario, I sell pretty princess wallpaper murals that ship for FREE in Canada and the USA. They are quick and easy to hang and peel right off the wall when you’re ready to redecorate. Get a Quote on a Hand-Painted Mural! Thinking of a princess mural for your girl’s bedroom? 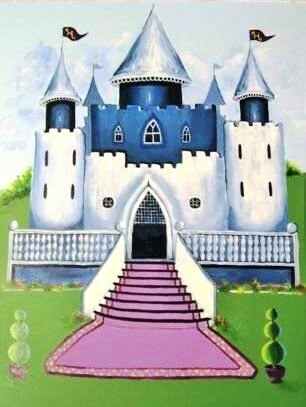 Here are some photos of a mural I painted that is fit for a princess – so you can get some ideas for your own space. Hayley is mom and dad’s princess and loves all things pretty. 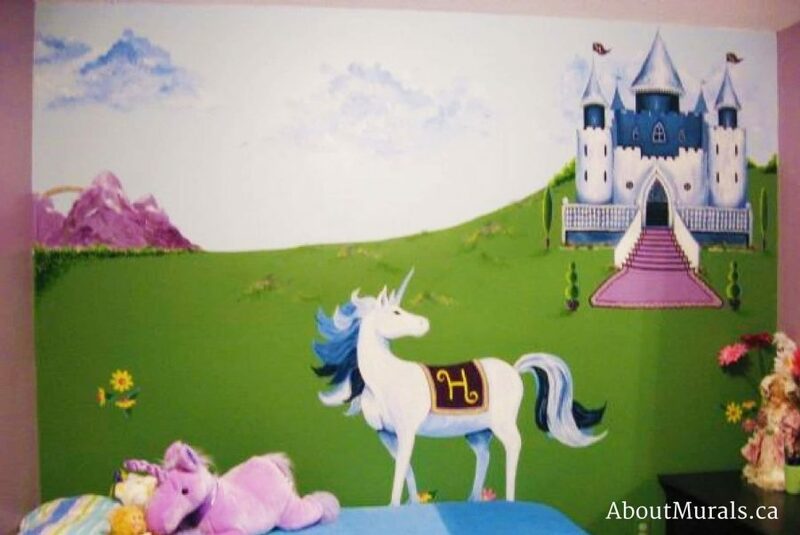 Since they already have their princess, all this mural needed was a unicorn and royal castle. Her mom and dad painted the grass and sky before I came to paint the mural to save on cost, but this is a service I offer if you’re not the DIY type. If you do it yourself, I can give you some advice on colour and how to paint the background. The fun thing about hand-painted murals is that they can be personalized. 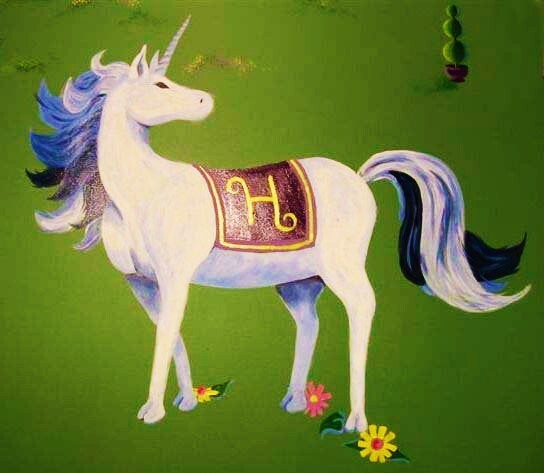 I painted the letter “H” for Hayley on the unicorn’s saddle. I paint all my murals with non-toxic acrylic paint and no-VOC latex paint, so the air quality is safe for your kids to play and sleep in – even on the night that I finish the mural! My wallpaper murals are eco-friendly, too. Like My Mural? Hire Me! Still thinking of a princess mural and like my style? Let’s work together! I’ve been painting wall murals, from Toronto to Niagara Falls, since 2005. I even had the opportunity to paint a mural on a Mike Holmes TV Show! Give me a shout for a free consultation. My prices start at $350. Or…Browse my Princess Murals on Wallpaper! Join my newsletter community and I’ll send all the latest promotions and maybe even a hot coupon code or two!